A worthwhile update, but the Traktor concept is starting to show its age and needs freshening up. Excellent EQ and effects. As stable as ever. Nice touches, such as channel audio inputs. Beat detection not as good as Live’s. Track number still limited. Poor provision for loops. Traktor 3 has an impressive new interface. Make fine adjustments to each FX type. Traktor still faces tough competition from Live. A few years ago, the developers at Native Instruments asked DJs to ditch their aging turntables and oversized CD decks and use their computers instead. Launched in 2001 and proving itself the right tool for the job, the successful DJing software Traktor has now reached its third edition. The first thing Traktor veterans will notice about this update is the new interface. Fortunately, there are now four virtual decks - twice as many as before - but unfortunately, this means that the Traktor window has become a very busy place indeed. You can´t even fit four open decks and the browser on a standard 1024x768 laptop screen. As in version 2.6, you can minimise and customise the onscreen elements and layout, but despite the inclusion of ten user-definable, keyboard-triggered screensets, it all seems a little cramped. Assigning major controls to a hardware controller would improve matters considerably, but a quick look at the preferences shows that the system for doing this hasn´t improved measurably. It´s certainly more complicated than it needs to be. One thing that´s finally been added is a selection of effects, and these really are excellent. The filter section in the previous version was great, but now you can add all manner of creative processing to each channel and (finally) to the main output. This is even more important now that there are four channels on offer. Speaking of those extra channels, the original mixer has been replaced by an excellent emulation of the classic Allen & Heath Xone:92 club mixer, which even features the original´s EQs (there´s also an option to use emulations of the EQ from the Ecler Nuo4). And, because external signals can be run into Traktor´s channels, you basically get an extremely expensive club mixer that you can also use with your existing turntables and CD decks. There are other improvements behind the scenes. Higher track analysis priority is now given to tracks that are loaded into the decks - previously, this was just done in ‘list order´ - and features such as this help to streamline the user experience and improve the real-world usability and stability of the program. Mouse functionality has improved, too. You can now make use of multiple buttons and the scroll-wheel, putting far more functions at your fingertips. And, if it´s hands-on control you´re after, Traktor is the best companion software for Stanton´s Final Scratch 2 hardware. Also new is a front panel display that speeds up timecode assignments and features a timecode monitoring panel so you can quickly spot and solve any sync problems. There are so many other refinements that we couldn´t possibly list them all here, but a few that stand out are the easy recording of external audio, built-in browser integration with the excellent Beatport dance music download shop, live input into each of the audio channels, a nifty page-based top bar navigation interface, improved cueing and looping functions with multiple hot-points, slightly improved non-destructive DJ mix recording (though this is still not nearly editable enough) and enhanced beat grid and tempo matching facilities. 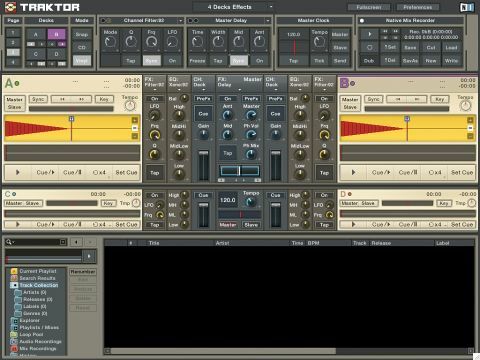 Traktor 3 is best described as an excellent refinement. It offers vastly increased functionality and plenty of new features, and retains everything that made the previous versions so popular. But, in light of the progress Ableton´s Live has made over the past couple of years, we can´t help but think that the whole concept of Traktor has almost had its day. Because it emulates the layout and interface of yesterday´s technology (rack-mounted CD decks were only ever a functional stop-gap), Traktor is inherently limited. It would be nice to see Native Instruments come up with something a lot more radical for the next version - when it comes to challenging Ableton, they´re surely the best-equipped company out there. If you´re an existing user who doesn´t want to do more than mix tracks and add the odd loop in a familiar environment, Traktor 3 is well worth the upgrade price. Also, if you´re a scratch DJ and you plan to invest in (or already own) Final Scratch 2, this is the smartest software choice. However, if you´re just starting out in the DJing world and want the easiest option, or if you´re a creative DJ and want more mixing power than you could ever dream of, Live 5 is the way to go.